You can barrel out to western Massachusetts at high speed via I-90, the Mass Pike, the east-west super highway stretching from Boston to West Stockbridge. Wait! Look at a map for two slower-moving and scenic options. Route 2 -- also called the Mohawk Trail -- travels east-west across the northern tier of the state. And Route 20 -- Jacob's Ladder Trail -- traverses Massachusetts across the southern part of the state, often intersecting I-90. 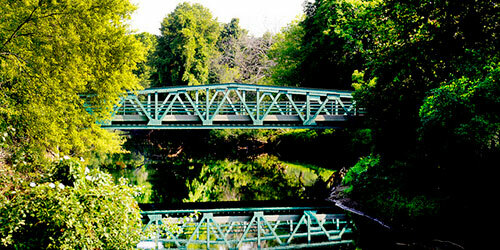 Along routes 2 and 20, you see at close hand the region's small towns, stone walls, streams and rivers, church steeples, gardens and farm fields. Choose I-90 for speed and routes 2 or 20 for close-up scenes of New England life. Take I-95 North along Long Island Sound and switch to I-91 in New Haven, traveling north through the center of Connecticut. In Massachusetts, join Route 2 westbound near Springfield. Just south of the city of Albany, cross into Massachusetts on I-90 traveling eastward. Editor's Choice - The BerkshiresThis historic house and its wonderfully impish gardens dates from 1885, the Gilded Age period when wealthy people from New York, Philadelphia, and the Midwest built summer "cottages" of dozens of rooms, and then shuttled among them -- from Newport, RI; to Stockbridge, MA; to the horse races in Saratoga, NY -- during "the season." 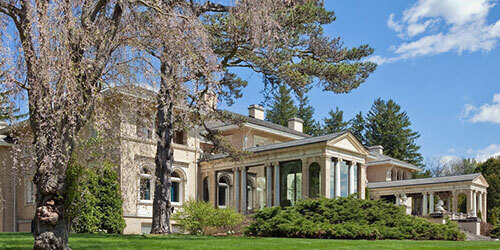 Naumkeag is a shingle-style marvel designed by the architect Stanford White for Joseph Choate, a New York lawyer. Naumkeag guides tell marvelous stories about this creative, philanthropic, and star-crossed family. Choate's daughter, Mabel, worked with her garden designer, Fletcher Steele, over a period of three decades to create these marvelous and whimsical gardens. 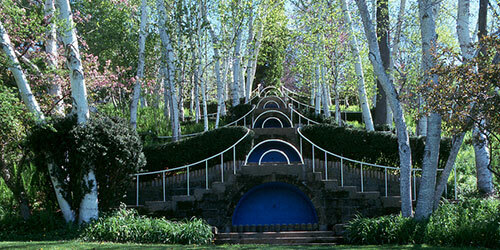 A famous image is that of the Blue Steps, a series of deep blue fountain pools flanked by four flights of stairs and a grove of white birches. The Afternoon Garden off the side of the house is ringed by tall, brightly painted replicas of Venetian gondola poles that almost make people laugh with pure delight. Neither was slave to straight lines; curving borders snake playfully all around the gardens. 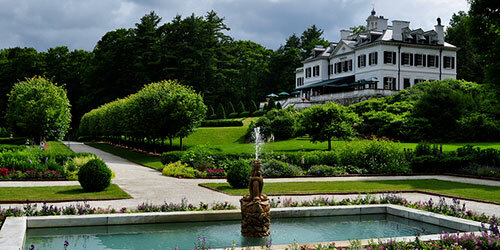 The Berkshires was a summer getaway for artists and their wealthy patrons in the Gilded Age period of the 1870s to World War I. Daniel Chester French was a prestigious sculptor of the time. Born in 1850 and raised in Concord, MA, French began his career at age 25 by sculpting the Minute Man statue in Concord. He sculpted the statue of Abraham Lincoln at the Lincoln Memorial in Washington, DC. French had a studio in New York and he created a home and studio -- designed to capture northern light and frame a dreamy garden -- in Stockbridge in 1896. Chesterwood's knowledgeable guides will walk you through the French's studio, built with tracks that let him push large works outdoors. A wide porch unveils a panoramic view of the Berkshire hills, including a farm that French managed and loved. On display is his last work, Andromeda, a reclining woman, which he was finishing at the time of his death at age 81. You can see small models of his works in progress and learn exactly how a rough draft in clay because transfigured into heroic marble or bronze images. The Mount (built 1902) is the home and gardens of Edith Wharton, (1862-1937) who was born into wealthy high society of Old New York, where women managed the home and social life but did not express themselves outside that circle. Nevertheless, Wharton developed an expertise and wrote 40 books about garden and interior design and architecture, as well as several novels. Her breakout novel "The House of Mirth" skewered the consumerism and low taste of New York's high society. She lived in Paris for much of her life; during World War I, she raised money to establish orphanages and facilities for wounded soldiers. Expert guides lead visitors through the Mount, explaining how the building and gardens are an expression of Wharton's tastes, as outlined in her 1897 book "The Decoration of Houses," which is still used as a reference in interior design. The house is packed with stories about her ill-fated marriage to a man who suffered from mental illness, her many friendships, her insistence of intellectual rigor in conversation and relationships, and her love of French culture and design. The gardens are formal and magnificent, including a very rare example of grass steps. Founded in 1969, the Norman Rockwell Museum is the motherlode of works and stories about Norman Rockwell, whose illustrations in the Saturday Evening Post defined America's vision of itself for decades during the mid-20th century -- sometimes called The American Century. The Museum houses 998 original paintings and drawings. Rockwell's studio, originally in downtown Stockbridge, was moved to the museum site. It has original art materials, his library, furnishings, and personal items, along with an archive of the artist's papers and possessions. 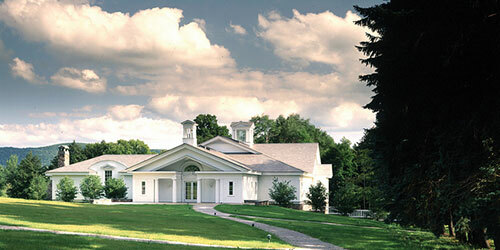 The museum and studio grounds give visitors a moment to exhale and enjoy a wonderfully peaceful mountain view. A handful of perfectly delightful statues of children tumbling in play, as if down the hillside, dot the path from the museum to the studio; they are the works of Peter Rockwell, son of Norman. Many of Rockwell's world-renowned images were drawn from the surrounding community and its residents. The museum offers rotating exhibits and many programs for adults, like talks by curators, and kids, like a summer sketching club. It would be hard to leave a visit to the Hancock Shaker Village without a deep respect for the breakaway Protestant sect that settled here in the late 1700s and created a community of technical innovation and peaceful cooperation. The people who created this utopian "City of Peace," believed the male and female natures co-existed in God; both genders were treated equally. The village peaked in the 1830s with 300 Believers and 3,000 acres of land, but it lost membership because of its vow of celibacy and the growing urbanization of the country. The technical accomplishments of the Hancock Shakers are a marvel. Their famous round barn was an innovation to prevent barn fires by creating a central air shaft in what was, in effect a giant silo. In workshops, visitors can see volunteers doing the weaving and woodworking -- like the creation of Shaker boxes -- that these people perfected. 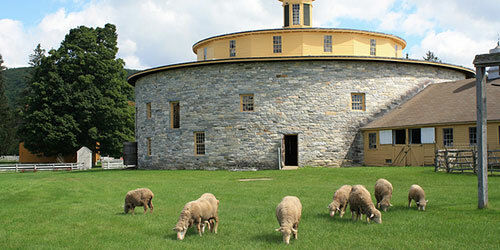 The crops on the property are raised from heirloom seeds used and conserved by the Shakers. 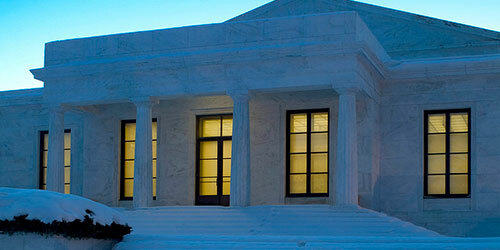 The main residence is austere and peaceful, with Shaker furniture and innovative designs to capture natural light. 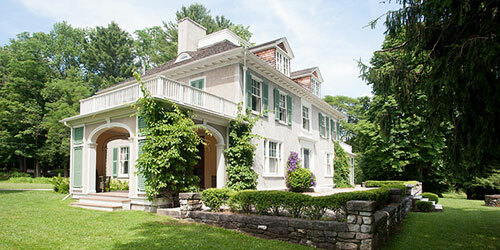 The Sterling and Francine Clark Art Institute -- "the Clark" -- in Williamstown is a trove of marvelous works, including French Impressionist paintings, British oil sketches, drawings, silver, and paintings by Winslow Homer, George Inness, and John Singer Sargent. In 2014, the institution was expanded with a massive new wing, galleries, and a brilliant reflecting pool designed by prize-winning architect Tadao Ando. The museum store is a joy, filled with art books and bits of frippery like artist-inspired jewelry, bangles, and scarves. The new addition, framed by long, low walls of red granite, re-stages and re-frames the building's relationship with the beautiful surrounding Berkshire hills. Permanent exhibits are enhanced by temporary shows, like "Van Gogh and Nature" in the summer of 2015. Walking trails traverse the property, including trails up Stone Hill, presenting a spectacular view of Williamstown and the Green Mountains of Vermont. 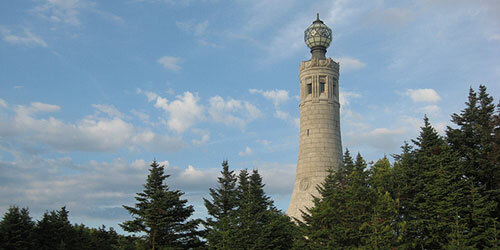 At 3,491 feet, Mount Greylock is the highest point in Massachusetts and the state's first wilderness park. Mount Greylock has 70 miles of trails for hiking, mountain biking, back-country skiing, snowshoeing and snowmobiling, including a section of the Appalachian Trail. Primitive camping may be done at a campground or remote trailside shelters. People come to the mountain to enjoy the views and watch for birds, butterflies, and wildflowers. Hunting is allowed in season. In winter, trails are available for snowmobiling, snowshoeing and back-country skiing. The peak of the mountain is an easy drive up a well-maintaining and marvelously banked two-lane road. Several turnouts allow great views and rest for cyclists and hikers. This peak is part of the Appalachian Trail. As you reach the top, you see the rustic and comfortable Bascom Lodge, which offers lodging and meals. A short walk takes you to the Massachusetts Veterans War Memorial Tower, dedicated in 1933. At the top of the graceful tower is a beacon that is lit year-round, dimming only for short periods in fall and spring to accommodate migrating birds. The Red Lion Inn on Stockbridge's Main Street has been welcoming guests since it sheltered travelers bumping along the Albany-to-Boston road in 1773. A porch spans the entire front of the building; guests and local people love to sit, sip drinks, and watch the world stroll by. The building appears in Norman Rockwell's famous "Christmas in Stockbridge" painting that the town re-creates every year. An owner of the inn from the 1860s collected china and furniture that is on display, along with Rockwell prints and a working "birdcage" elevator. 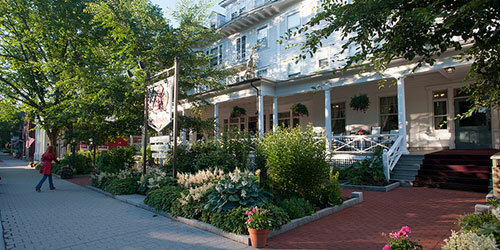 The main building includes a formal dining room, Widow Bingham's Tavern, and the Lion's Den Pub (live music nightly). The Orchards Hotel is just down the road from Williams College, the architectural focal point of the town, and the Williamstown Theatre Festival, which brings fantastic live theater to the region from June to August. The Orchards spoils its guests during warm weather with a courtyard, landscaped pond and flower garden. Dine al fresco here in the warmer months, surrounded by purple irises (a tribute to nearby Williams College's school colors). Indoors, a cozy living room offers an antique Steinway piano, classic art work, and a cracking fire in the fireplace on chilly days. The Hotel on North on North Main Street in Pittsfield is a crisply urban but comfortable new boutique hotel in the heart of downtown. The restored building is a melding of two older commercial structures including a traditional Main Street department store. Now, you walk through the revised entrance and you are greeted by a serpentine black leather chaise lounge that declares a cool, informed statement of style. Beautiful small artifacts of the building's commercial past accent the interiors everywhere you look. Public lounges are comfortable but not stodgy, and the hotel restaurant offers a raw bar and a beverage list stocked with Berkshire-made products.